CONGRATULATIONS FOR SURVIVING THE END OF THE WORLD! Now that I got that piece of important business out of the way, this is my obligatory year-end blog that I’ve been posting the past three years. I’ve switched to WordPress from Blogger, but you can still check out last year’s year-in-review right HERE. – Book more AFTRA principal work – SAG and AFTRA merged and become “One Union” as of April 1st, 2012. I have booked some SAG short films, and also, booked my first LEAD in a SAG feature film! – Book the SAG job that “seals the deal” – Once again, due to the merger, after 18 months of being eligible for the SAG and not joining, the decision to join was already made for me. – Get more equity auditions. Get more callbacks. BOOK – Thanks to my managers at KL Jago Talent, I got a few more equity auditions during the year, but did not book. Focusing more on film/tv right now, and that’s perfectly fine! – Take improv at UCB – Ok, still haven’t done this one, but 2013 will be the year! I swear! – Keep on working with amazing agents and managers – I was signed with KL Jago Talent in January, and recently, was asked to renew my contract for 2 more years! Also, thanks to my manager Kim Jago, I started freelancing with Innovative Artists Agency for commercial! – Run a marathon as close to 4 hours as possible – Due to the aftermath of Hurricane Sandy, the 2012 ING NYC Marathon was CANCELED on the Friday right before the race. It was honestly the best decision, but a lot of runners were disappointed in the super late notification (as they should’ve been). However, 2013 will be a great year for running! In March, I attended a photo shoot for a social networking site called Badoo, which launched in the U.S., with the event being hosted by Nick Cannon. I, along with over 1,000 other New Yorkers, had our portraits taken by 4 celebrity photographers, with the hopes of being chosen as the 26 faces to be splashed onto billboards, subway stations and such all over New York City. After a lot of hustling, and AMAZING friends, I was the female Peoples’ Choice winner, with over 4,000 votes in one week! You can read my blog about Badoo HERE. I was also one of the 4 finalists who were featured in a Badoo.com video spot! Check me out playing ukulele and singing opera, all while running! Right on the corner of 16th Street and 8th Avenue in Manhattan! And right next to a STARBUCKS! AWESOME! Rockin’ it out in Queens, baby! Outside of Not Ray’s Pizza in my hometown of Brooklyn, NY! They gave me a free slice of AWESOME pizza because of me being a “celebrity” in town! Go eat there!!! The merger of SAG and AFTRA also happened this year, which meant a lot less auditions for me, but it also meant getting in the pool for some AMAZING opportunities! I got to audition for my very first Hollywood studio feature film in a supporting role! I signed a non-disclosure agreement, so I can’t say what it was, but it’s a sequel to a VERY big superhero film series! Also, I recently got to audition for a day player role on Nurse Jackie, as well as more SAG commercials. Now I’m getting some good quality gigs to audition for, as opposed to a greater quantity of smaller gigs. It’s tough, but I’m looking forward to more opportunities in 2013! As I had mentioned above in the update to last year’s goals, I booked my first LEAD in a SAG feature film! It was actually my very first time auditioning for a lead role in a feature film, so it was a wonderful surprise! I truly had a great time at the initial audition, as well as the callback, and I consider myself truly blessed to have been given such an amazing opportunity. The film is tentatively titled “Ninastiko,” and I play a scientist with two sons. We’ve filmed in Brookhaven National Lab on Long Island, flew out to film in Fermilab in Chicago, and will be flying out to Arizona to wrap up the film earlier in 2013. I’ve been working with a truly talented cast, as well as awesome directors Daniel Schmidt and Alex Carver. Daniel has won numerous international film awards for his previous work, and this is Alex’s first feature film. What an awesome and wild ride this has been! I’ve been face-to-face with a particle accelerator, flew a plane, and hung out with some bison! The STAR detector at Brookhaven National Lab! Still from “Ninastiko”. Me and Jen Kim from The Bourne Legacy right in front of the STAR detector. My character is pretty awful to her, despite the smile. Now that’s good eatin’! And I got to fly a small plane! Well, sorta, lol. The pilot let me actually do some turns, which was pretty sweet! I felt like Tom Cruise, pre-Scientology, of course! In January, the SAG feature film that I got my first day player role in, “That’s What She Said,” got to premiere at the Sundance Film Festival! I didn’t end up going, but I did get to go to the New York premiere at Soho International Film Festival, and attended the limited theatrical release in New York at Cinema Village. It was pretty sweet to see the film again on the big screen and see my Scissor-Happy Chinese Beautician role get some laughs in the audience! The film stars Anne Heche, Marcia DeBonis and Alia Shawkat, and was directed by the beautiful and talented Carrie Preston! At the New York premiere of “That’s What She Said” at Soho International Film Festival. First time on the red carpet! I’ll forever be grateful for Carrie Preston having me be a part of her film! She’s incredible! From the Andrew WK music video shoot. I played a laundromat girl, being directed by Shawn Caple. And that’s my pink polka-dot bra on AWK’s head. Andrew WK, me and my now-famous pink polka-dot bra. This year, I decided to do some more stand-up, hit a bunch of open mics, and I’ve met a great network of funny people. I auditioned for the NBC Stand-up for Diversity Showcase, which I didn’t get picked for, but I went ahead, camped out overnight outside of the Comedy Cellar, the place where lots of the comedic greats got their start, and I JUST DID IT. Nothing beats just going for things! Oh yeah, the song is in German, naturally, since Strudel IS a German name after all! One day, I’ll write my memoirs, but I must say, it was pretty magical knowing that I had made so many Christmas memories for so many families, and am now in thousands of photo albums! Working that job made me REALLY want to have ethnically ambiguous children soon-ish! – Book more SAG-AFTRA roles! – Take classes at UCB. For realz. – Do more stand-up/write more comedy songs. – Run a marathon in as close to 4 hours as possible. – Keep on working with amazing agents and managers. – Do something scary and challenging. Sooo…I’m utterly grateful for all of my friends and family for being so amazingly supportive of my career! It never ever feels easy, and it’s a challenge every day, but with you guys in my life, I feel truly blessed and know that I can accomplish great things when I put my mind to it! To all of the people in my life, THANK YOU!!! 2013 is gonna ROCK!!! On March 30th, 2012, the Screen Actors Guild and American Federation of Television and Radio Artists merged and became ONE UNION. 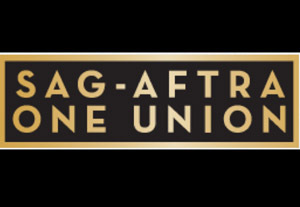 The new name for this one union: SAG-AFTRA. I know that a lot of you are hoping for a more creative name. CONGRATULATIONS to all of my SAG and AFTRA friends! We are now ONE voice in the entertainment industry! Hopefully this will bring more jobs, better contracts, and so on, so forth. For those who were one union or the other, it probably felt good to not have to pay additional money to join the other union. For those who joined SAG recently and wished that they waited, well, my thinking is that you’re probably in a better position, since you already got yourself placed in the pool of SAG actors before the influx of AFTRA-only actors got into the mix. Well, then I became a dreaded “Must-Join” (which means that you need to join the union before you can work another job for that union), and I couldn’t submit whenever there was an AFTRA project, unless I was willing to join. Being somebody who always wants to “earn” what they get, I decided that I wasn’t going to join AFTRA until I booked a speaking part. So a year after I received my AFTRA waiver, I was called by director Frank Mosca for a PSA that was being pitched to FOX. A month later, it was picked up! That was my first AFTRA Principal Contract! The PSA was titled “The R-Word”, or now, it’s better known as “Not Acceptable” R-Word PSA”. It was my first national commercial, and it premiered on May 24th, 2011 in the last 10 minutes of the season finale of FOX’s “Glee”. It was pretty neat! The PSA also starred Jane Lynch and Lauren Potter…and ME! So BOOM! There’s my gateway to AFTRA! With SAG, I had been eligible since October of 2011. I had received 3 SAG waivers for doing background work, VERY quickly, all thanks to Grant Wilfley Casting. During the time of my “OK-30” (the time period where you’re eligible to work union work without having to join yet), I was fortunate enough to book more SAG work, including getting upgraded to DAY PLAYER for a SAG indie film, “That’s What She Said,” starring Anne Heche and directed by Carrie Preston. The film actually ended up getting accepted to the Sundance Film Festival this year, and I will also get to go to the New York Premiere at the Soho International Film Festival! Totally excited! And if it weren’t for being in my OK-30, I would’ve never gotten the opportunity for the upgrade! You would think that the day player contract would be a good enough reason to join SAG immediately, right? Well, not really. I booked a lot of work as a principal for non-union commercials and industrials, as well as other feature films. Some people think of “non-union” as un-professional. Well, it’s not true. Some of the BEST gigs I’ve ever worked on were non-union, and I wouldn’t have traded those experiences for the world. Also, non-union commercials are run EXTREMELY professionally. The only real difference is the pay and certain little things that are under a SAG contract. Otherwise, totally legit work. I will confess. A part of me was somewhat “scared” of the merger. I enjoyed getting lots of calls for auditions and booking non-union principal work. I enjoy being a WORKING actor. I enjoy NOT having to do background work to make a living. I had heard from some of my SAG friends that it got way more difficult for them to book work and even get called in for auditions after they joined. Yikes! Well, I decided that I would join SAG once I booked that gig that would “seal the deal.” So that to me meant booking a principal role in a national network commercial or a day player role in a feature film or episodic. I had gotten auditions for national SAG commercials, and even a callback on my first try (for a New Balance commercial), but no booking. I wanted to EARN this SAG card, dammit, so someone needed to book me! And then the merger went through. A part of me wanted it to, but a part of me who was still hellbent on earning all of my achievements didn’t quite. I DID vote “Yes” to the merger, so I was part of that 86% of AFTRA members who voted FOR it. Am I glad that I saved $2,335 on joining SAG? Yes. Am I scared of the additional competition in an already crazy competitive field? Well, I was. But after a meeting with my manager, I know that in order to progress, I NEED to keep on moving FORWARD. Staying non-SAG felt like it was helping me, but if I wanted a meeting with a legit agent, I would NEED to be SAG. I have great commercial agents, and get sent out a good amount, but it’s time to step it up. After being SAG-eligible for 18 months and not joining, the universe decided it all for me. My name is Teresa, and I am a VERY proud member of SAG-AFTRA.